I am based in Sydney and run the New South Wales shelter for the Australian Cavy Sanctuary. 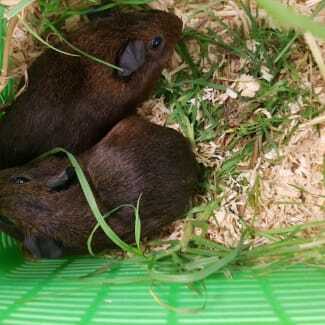 I have rescued well over 2000 guinea pigs from many different situations where they need a second chance at life. Aly was one of a number of guinea from a large rescue of over 120 guinea pigs. She was young when she arrived and has been on pregnancy watch to ensure she is not pregnant. She is settling in and has a number of friends that she can be rehomed with. 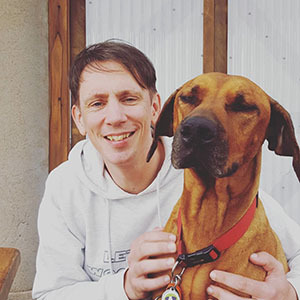 She is photographed here with Donut who looks to be a little older. Both of these girls have been friends with Lulabell and Blackberry who have been in rescue with them. They can be rehomed as pairs in any combination of the group. Donut was one of a number of guinea from a large rescue of over 120 guinea pigs. She was young when she arrived and has been on pregnancy watch to ensure she is not pregnant. She is settling in and has a number of friends that she can be rehomed with. She is photographed here with Aly who looks to be a little older. Both of these girls have been friends with Lulabell and Blackberry who have been in rescue with them. They can be rehomed as pairs in any combination of the group. Jasper is a really cute little abysinian. 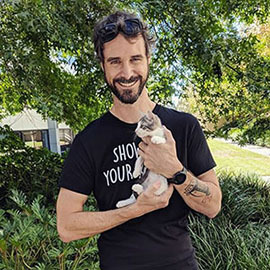 He came into rescue with the large group of 33 early December 2018. He was just a pup. He battled a little with fungal in the early days and is not fully recovered and re-growing his fur. He is just adorable. Calls out for food and attention. He is more outgoing, but has a big pesonality. Jasper gets along really well with Cheeky. 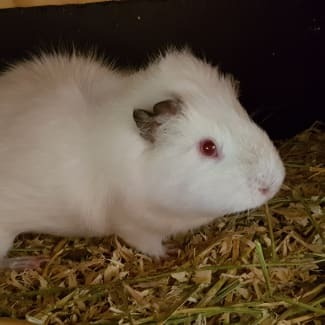 Snowcone was a guinea pig that we caught that had been running free for about a month near Drummoyne. We know he was running for that timeframe as only a month before a family had spotted an identicle looking guinea pig. They realised it had been abandoned and set to catching it. They caught the piggie and gave her a home. It was only when someone noticed this second piggie 4 weeks later and as followers of the Cavy Central page, they reached out. They felt awful as they thought they had caught the only piggie, but as they looked identicle did not know there was a second. It took about 6 hours until we caught this little piggie. He was so frightened. He had been hiding in the rat tunnels that went around the base of enormous flax plants ( which are completely inedible). He screamed and screamed upon catching him as he was so frightened. It has taken considerable time for him to settle into rescue and only now is he started to come out of his shell. 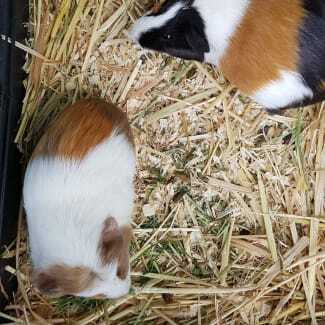 He also had a buddy that he loved called Radichio who was another abandoned piggie and they both got along. However one day Radichio was found dead in his cage with no symptom or injury. So sadly Snowcone is again on his own. We would estimate he was about 6 months of age when we caught him. Update: Amelia is not pregnant. She is clear and ready to find a home. Her buddy was pregnant and she has now littered 2 young and will remain in rescue. 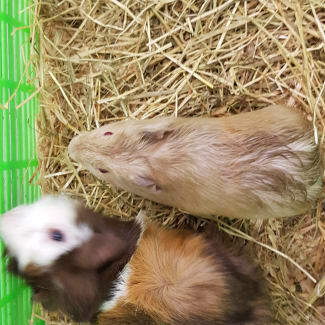 Original: These two gorgeous guinea pigs have come to rescue on the 11th January 2019 and are pregnant having been rescued free range property on the central coast. They will remain here in rescue until pups are born and their temperament settles and are ready to find a wonderful home. They are about 6 months of age now. Ideally it would be lovely to find them a home together. They could possibly be siblings. Amelia is on the left in the photo and has more white in her coat.